Strawberry flavoured cupcake topped with strawberry cream icing. Decadent Strawberry Cupcakes by Smoor! In every cupcake we bake at Smoor, there is an assurance of the use of finest quality ingredients and the freshness of the same. Right from baking, decorating to delivering, we offer the best services one can experience. Our selection of cupcakes features a plethora of flavors; including vanilla, chocolate and strawberry. Whether it is ordering a birthday cake online in Bangalore, or a casual get-together, we will take care of the home delivery of online cakes. Once you make your selection, add the product in the cart online and order away. According to your preferred delivery option, next-day or fixed-day delivery we will bring the cakes right at your doorstep. 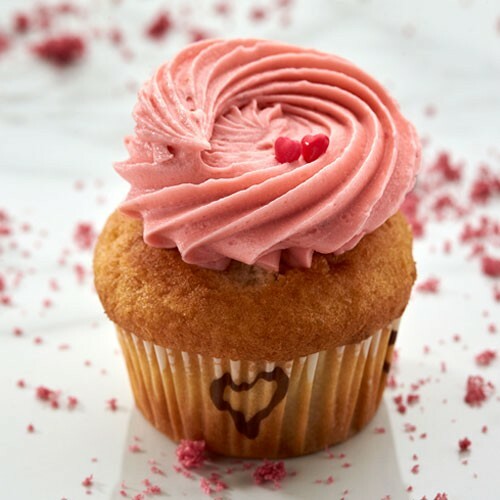 Our exclusive cupcake design is one with a massive muffin case including a strawberry flavored cupcake topped with strawberry cream icing pleasing both, your appetite and taste buds, so buy a strawberry surprise online right away.